Tommy Wright was understandably delighted with St Johnstone's late win at Inverness after they were reduced to 10 men early in the second half. Dave Mackay was dismissed for a challenge on Carl Tremarco but Saints snatched victory through Liam Craig's stoppage-time penalty. The result maintained the Perth side's top-six position in the Premiership. "We'll play a lot better and lose but I'll take the result as defensively we showed character," said Wright. "I thought early doors that this game was going towards a 0-0. Both sides were a little bit quiet and not much was happening in the game. "I was giving the fourth official pelters as I thought it [the Mackay dismissal] was a poor decision but I've seen it again and apologised as I can understand why the ref's given it but it wasn't malicious. "The foot was a little high but it was controlled and it could have been a yellow. Fair play to the referee, he's made the decision. "We were joking that we should go down to 10 men more often as that's us taken six points from the two games with red cards. "I was pleased with the defending and delighted to have our first clean sheet of the season." 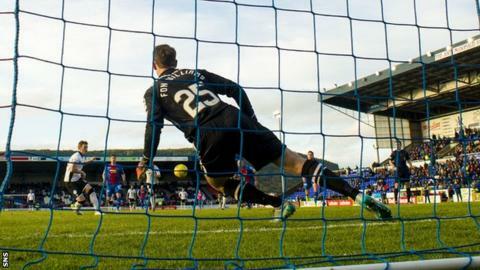 Inverness Caledonian Thistle boss John Hughes was philosophical about conceding the penalty that led to the St Johnstone goal, with Danny Devine fouling Craig. Hughes was more concerned about his side's lack of creativity against 10 men. "We were one paced and void of creativity in the final third," he said. "[The penalty] was down to a lack of concentration and we were sucker-punched but we will learn from that. "Playing against 10 men for almost the whole of the second half we have to be more ruthless. We got a lot of crosses into the box but the movement was poor."